This page sets out what I have on the dress and equipage generally of the Local Militia of North Yorkshire, and specifically for each of the six numbered regiments formed in 1808-9. For the Third and Fourth Regiments I have come across next to nothing, and in general much archival material could be added. The page should be seen as a work in progress that can be revised as new information arrives. Reference is made frequently to Howard Ripley & Bob Moodie, Local Militia Buttons, 1994 and 2002, and to Howard Ripley & Denis Darmanin, English Infantry Militia Buttons 1757-1881, 2010. 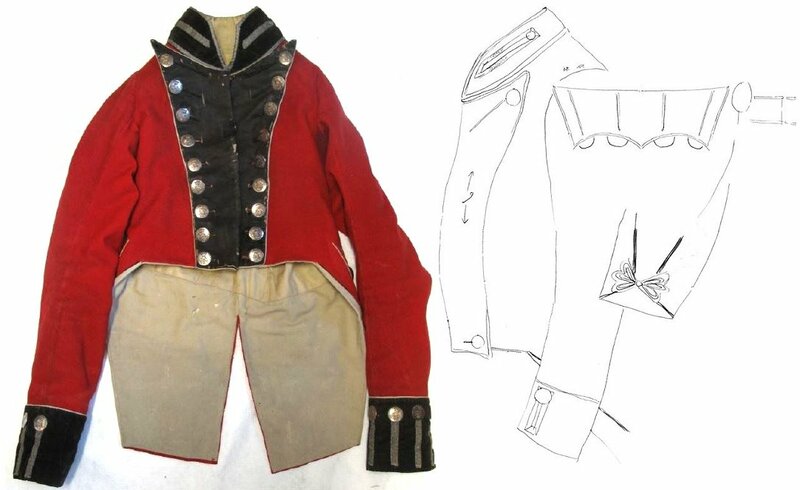 It’s important to note that in these two sources the attributions of two types of button, hence also their associated jackets, are at variance with the documentation of the museum where these jackets are kept; see under the Second and Sixth Regiments below. Thanks go to the Green Howards Museum and Trust, and to Zoe Utley, for details of those and other items in their collection, on which this page relies heavily. The initial organisation of the Local Militia regiments of the North Riding is well chronicled in M Y Ashcroft’s substantial documentation of the volunteer movement in North Yorkshire, To Escape the Monster’s Clutches (North Yorkshire County Record Office, 1977). It did not go smoothly; piecemeal transfers of volunteers created administrative headaches, and the process was not fully resolved until May 1809. The pattern was that of the single regiment of North Yorkshire Militia: black velvet facings, silver metal, buttons regularly spaced. Among the Local Militia regiments, certain details – belt plates and some buttons – remained regiment specific. (However, two garments discussed below have buttons which are also associated with the “regular” North York Militia, meaning that only their provenance ties them to the Local Militia.) The dress of the “regular” militia to be followed by the local regiments can be outlined as follows. Period entries in the Buckmaster and Hawkes tailors’ books at the National Army Museum (thanks to Ben Townsend for images of these) give a clear idea of the specifications for “regular” Militia officers’ coats: black velvet facings without lace, facings edged in white, buttons regularly spaced, eight buttons on each lapel, four on each cuff, two at the rear waist, and one small at each side of the collar. The Buckmaster book specifies twist button holes throughout except on the collar; the Hawkes book calls for holes on the lapels, pocket flaps and rear waist only. Both require buttons on the pointed cross pocket flaps and not, as often done, underneath them. Broadly speaking, the jackets discussed below for individual regiments fit this outline, though with less use of twist button holes. flap closures, with four large on each cuff and pocket flap, plus two large at the rear waist. The dress of the other ranks of the Local Militia would have adhered to that pattern. It appears that from 1805 the white rose was used by the “regular” Militia as a cap badge, and it is possible that this was also adopted by the Local Militia. The use of white belts by some Local Militia officers (see below) indicates that the men of their regiments also used accoutrements with white belts. 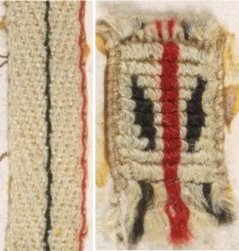 The Pearse book also includes a sample of the “regular” Militia drummer’s “broad” lace, which would probably have been worn by the drummers of the Local Militia regiments; this has a broad central red stripe, with black marks set in a “X” to each side. To be honest, the details in Pearse of the lacing of this drummer’s jacket are not entirely clear to me, and I will not try to interpret them here. Formed in 1808. Col Marwood Turner van Straubenzee, commissioned 22 November 1808. Van Straubenzee was, exceptionally for a local militia commanding officer, commissioned a full colonel because his regiment was initially oversized at more than 1200 men. At the Green Howards Museum at Richmond is a group of items identified to Captain Jonathan Smurthwaite of this regiment, consisting of a jacket, epaulette, gorget, shoulder belt and plate, sash and breeches. The scarlet jacket has a collar, cuffs and lapels of black velvet, all narrowly edged in white. The lapels have eight large buttons, the cuffs four, with one at each side of the collar, with no lace or twist holes. The buttons are silvered, slightly convex, the design showing a crown over a cartouche containing “1ST REGT”, all surrounded by “N Y L M”, clockwise from the left. They match a drawing by Ripley and Moodie, who give the diameter as 18 mm. The associated company officer’s epaulette is of the pattern distinctive to the North York Militia, with a plain silver vellum lace strap, a bifurcated crescent with a black fabric pad and a small spangle rose at the apex, and silver bullion fringe. The strap has a small button as described above. The whitened buff leather shoulder belt has an oval plate, silver, the etched design showing the title “First North York / Local Militia” in capitals with serifs, the broad strokes horizontally lined, surrounding a crowned Royal cipher over sprays of laurel. What may have been this example was once on display at the Castle Museum, York, but is no longer at York Museums. An example was sold in 2010 by Thomas Del Mar Ltd, and another is now at the National Army Museum, acquired in 1975. The gorget is of the regulation pattern, gilt, with black ribbons and rosettes. The sash is red. The associated breeches are of a strong brown suede leather; while they may have been Smurthwaite’s, they are not military and can have no connection with this uniform. The white belt mentioned above indicates that the men used accoutrements with whitened buff leather belts. The National Army Museum also lists an officer’s jacket and epaulette attributed to this regiment in its inventory, but I have no further details. Formed in 1808. Lieut Col Comm William Chaytor, commissioned 6 December 1808. The Green Howards Museum holds items identified to Captain George Rigge of this regiment, principally a coat. However, when this was on display at York Castle Museum in the ‘seventies it was attributed to the North York “regular” Militia, and the buttons are of a type also associated with that regiment. They are identified in Ripley & Moodie and Ripley & Darmanin to the Sixth Local Militia, but a confusion may have been made with the Mitchelson coat of that regiment, and I am following the museum’s documentation here. The coat is scarlet, with collar, lapels and cuffs of black velvet. The lapels, cut wide at the top, each have nine large buttons, with four on each cuff, four under each pocket flap and two at the rear waist. The top three buttons of each lapel have black twist holes, of diminishing length from first to third. A small button on each side of the collar has a silver lace hole, its end formed parallel to the front collar slope, and the collar is edged in the same silver lace; the cuff buttons also have silver lace holes, square ended. On each pocket flap are four twist button holes, now appearing greyish, but probably originally white. Between the rear waist buttons are four scarlet twist “holes”. The lapels, tops of cuffs, and pocket flaps sides and lower edges are all edged in white. The white turnbacks have a thin black edging; their points are connected by silver trefoils on a black cloth ground. The skirts are relatively short for a coat. On the right shoulder two small holes show that an epaulette or wing was once attached, which would indicate a field or flank company officer. The buttons are flat, in an older style, silvered, the recessed design showing a crown over a large rose between “North” and “York”; the large size has a diameter of 24 mm. As already noted, the design is identified to the Sixth Regiment by Ripley and Moodie, and also to the North York “regular” Militia by Ripley and Darmanin; the identification to the Sixth seems to be in error. coloured breeches, though it’s not clear if either of these is associated directly with the jacket. In 2015 a cocked hat marked “Rigge” was sold by Wallis and Wallis. It has a black cockade, a narrow silver lace loop held by a button matching those on the Green Howards coat, silver and crimson tassels and a white over red feather plume. It was attributed generally to the militia of the Riding, but clearly should belong with the coat at the Green Howards Museum. Also associated with that coat at the museum is a waist sword belt in dark leather with yellow metal fittings and gold lace trim on the slings. It’s shown here, but as a captain Rigge would not have worn such a belt, and it may not be a part of the same outfit. Formed in 1808. Lieut Col Comm Hon Lawrence Dundas, commissioned 24 September 1808. Formed in 1809. Lieut Col Comm William Rookes Leedes Serjeantson, commissioned 28 February 1809. 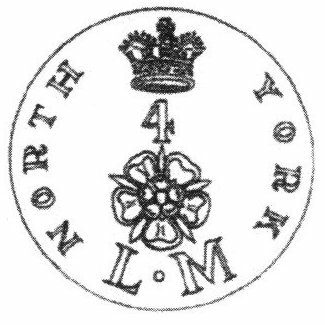 Howard Ripley and Denis Darmanin illustrate a button of this regiment, possibly silver, showing a crown over “4”, a rose and “L ● M”, between “NORTH” and “YORK” in Roman capitals. Formed in 1809. Lieut Col Comm John Fothergill, commissioned 28 February 1809. Several officer’s items of this regiment are kept at the Green Howards Museum, Richmond. Associated in one group are a jacket, epaulette and sash; a hat, sword belt and plate are of this regiment but appear not to be of the same provenance, while a gorget, waistcoat and breeches that may or may not be attributable to this regiment have in the past been displayed with the jacket etc at the museum. The scarlet jacket has a black velvet collar, cuffs and lapels, all edged narrowly in white. Each lapel has nine large buttons, with four to each cuff and one small at each side of the collar. Those on the collar have twist button holes, but there are no such holes on the lapels or cuffs. The buttons are silvered, convex, with a milled edge, showing a “5” within a four rayed star, within “ N Y L M” in script letters clockwise from the left. They match an example once on display at Castle Museum, York, and a drawing by Ripley & Moodie, who give the diameter as 20 mm. The company officer’s epaulette associated with this jacket is of the pattern distinctive to the North York Militia, with a plain silver vellum lace strap, a bifurcated crescent with a black fabric pad and a small silver wire rose at the centre, and silver bullion fringe. The strap has a small button as described above. The white leather sword belt plate at the same museum has an oval silvered plate, engraved with a crown over “NYLM” in ornate script, above “5”, all within a punched border of small “V” shapes. The sash associated with the jacket is red. The cocked hat at the same museum probably pre-dates the jacket. It has a black cockade, silver (and crimson?) tassels and a silver lace loop held by a button as described above. There is no surviving feather. A gorget, breeches and a white waistcoat with white cloth covered buttons have been displayed with these items in the past, but it is not clear if they are directly associated. The gorget appears to have been of the regulation pattern with black ribbons and rosettes. The white officer’s belt mentioned above indicates that the men used accoutrements with whitened buff leather belts. Formed in 1809. Lieut Col Comm Isaac Leatham, commissioned 28 February 1809. Lieut Col Comm Thomas Mitchelson, commissioned 12 April 1815. At the Green Howards Museum are two groups of items identified to Captain, later Lieutenant Colonel, Thomas Mitchelson of this regiment, though the attribution does not always seem to have been secure: central to these items is a jacket, which was once on display at the Castle Museum, York, where is was wrongly labelled as of the Fifth Local Militia. The buttons are of a type associated with the North Yorkshire Militia; in Ripley & Moodie and in Ripley & Darmanin, these are also attributed to the Second Local Militia. On the basis of the Mitchelson provenance, I am assuming that this in in error and that the jacket and associated items should be attributed to the Sixth. The scarlet jacket has a black velvet collar, cuffs and lapels, all narrowly edged in white. Each lapel has nine large buttons, with one at each side of the collar, four on each cuff, four on (not below) each pointed cross pocket flap and two at the rear waist. On the lapels, cuffs and pocket flaps the button holes are short and functional, with no extended twist holes; there is no hole or twist to the collar buttons. The sides and lower edges of the pocket flaps, and the rear opening and pleats are all narrowly edged in white. The turnbacks are white, with no edging and no ornaments at the points. The silvered button shows in relief a crowned garter with the “Honi Soit …” motto, enclosing a rose, above “North York”. Examples have been sold by Bosley’s and on eBay, and one is in the Gaunt collection at Birmingham Museums. A diameter of 16 mm has been noted for the small size. A drawing of this design, along with two others apparently not used, is in the Phillp album at Birmingham Museums, and is shown and discussed in this post. There are two versions, one with two outer petals uppermost, as in the Phillp drawing and on this jacket, the other with a single petal at the top, as made by Jennens. As noted above, these buttons are identified to the Second Local Militia by Ripley and Moodie, and also to the North York “regular” Militia by Ripley and Darmanin; the attribution to the Second seems to be in error. Two epaulettes are associated with this jacket. Both are of the North York Militia type, with plain silver vellum lace straps, bifurcated crescents with black fabric pad, with small silver wire roses at the apex, and silver bullion fringes. Each has a small button of the type described above. However, one epaulette has plain strap for a company officer, while the other bears a lieutenant colonel’s crown in gold wire with a scarlet interior; when the jacket was on display at York, only the company officer’s was attached, correctly to the right shoulder; conceivably, a second lieutenant colonel’s epaulette, to complete the pair, is now missing. Also at the museum and associated with Mitchelson are two red sashes, a waist sword belt and a pair of leather breeches. The sword belt is of whitened buff leather with gilt lion’s head buckle and fittings. This white belt indicates that the men used accoutrements with whitened buff leather belts. An officer’s coat is kept at York Museums (shown here), which when on display in the ‘seventies was identified to a regiment of this title, these place names being within the Riding. However, no such regiment with this title appears in the lists, and it’s possible that the identification of the coat was based on the initials on the buttons – “L K L” – making a connection to the Kiplin & Langton troop of yeomanry. More recently that identification seems to have been dropped, and the coat is now unattributed. It appears to have black facings, and is described thus by the Museum, but it does not match some other features of the garments discussed above. I’d suggest that the black facings are actually a very dark shade of blue, and that we can identify the coat to the Lindsey, Kesteven and Lincoln Local Militia of Lincolnshire; the buttons on the coat are virtually identical to that shown for this regiment by Ripley and Moodie. Associated with the coat is a pair of white breeches.